Chop 2 gloves of garlic. Mix the garlic with 200 gr. chicken breast and the juice of 1 lime and let it marinade for 2 hours. Roast 60 gr. of pine nuts in a frying pan (without oil) and set aside. Slice 1 red onion in halved rings and slice 1 red bell pepper and 250 gr. of mushrooms. Fry the vegetables in a frying pan until golden. Place the chicken in a preheated oven (220°C) until tender and done. Cut them in long strips. 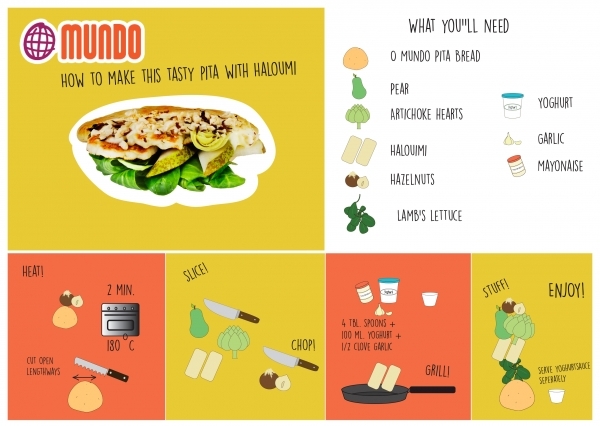 Place 4 O Mundo Pita's in a toaster or preheated oven and heat until brown. Open them sideways and add some humus. Add some chicken strips, onion, bell pepper and mushrooms and finish with a handful of rocket leafs. Preheat the oven to 180°C. Place 50 gr. hazelnuts and 4 O Mundo Pita breads in a baking dish for approximately 5-8 min. Undo 2 pears of it's core and slice them into long strips. You can leave the peel on, just make sure you've washed them. Mix 100 ml. of yoghurt with 4 tblsp. of mayonaisse and 1/2 chopped glove of garlic. Chop some dille and add to the garlic-mayonaise. Add some salt and pepper to taste. Take the hazelnuts out of the oven and roughly chop them up. Open the pita breads and add lettuce, pear, artichoke hearts and some hazelnuts. Heat a frying pan and cut 200 gr. halloumi into slices. Grill the halloumi pieces on both sideds for 1 1/2 minute. 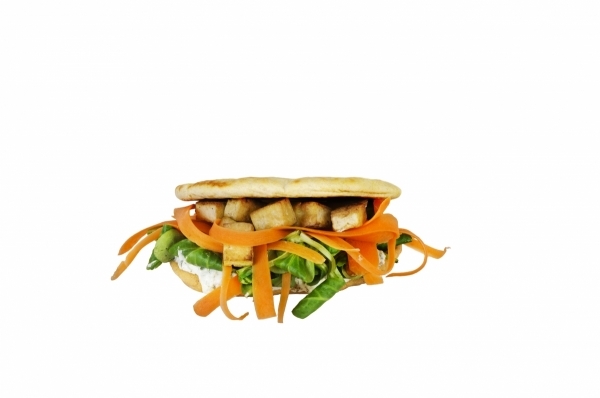 Place the halloumi into the pita breads and serve with the garlic mayonaise. Slice 4 sausages lengthways and add a little olive oil on them. Heat up a grill and grill the sausages for 8 to 10 min. until they're done. Cut a cucumber lengthways in half and remove the seeds. Cut the cucumber into pieces so it will fit into the blender. Add 1/2 glove of garlic, 15 gr. of coriander, 1 tspn. of ground cumin and 125 gr. of crème fraîche to then blender and blend for 10 seconds. Add some salt and pepper to taste. Cut open 4 heated O Mundo Pita Breads and add a handful of rocket. 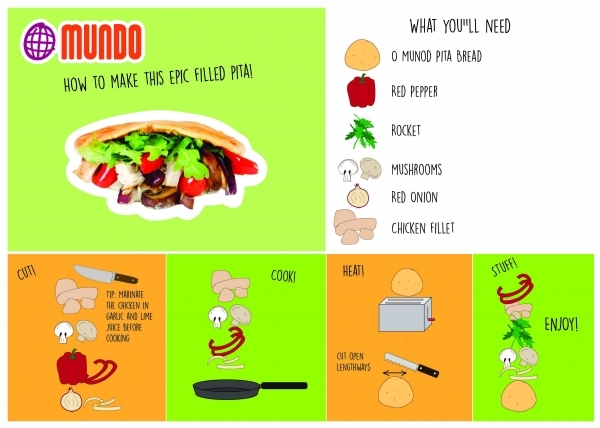 Top it with the sausages and de cucumber salsa. Tip: Take to easy way and replace the cucumber salsa with some ready made tzatziki. Heat 3 tblsp. of olive oil in a frying pan. Slice some tofu into cubes and fry them until golden and crispy. Peel 1 carrot lenghtways. 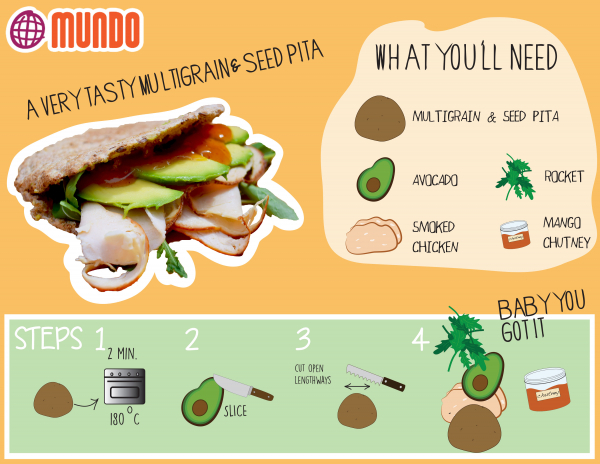 Toast the O Mundo Pita Breads in a oven or toaster. Cut the breads open en fill with some tzatziki, some lettuce and the carrot. Finish with the fried tofu and some more tzatziki.